Your comprehensive web portal for sailing in the Dallas/Fort Worth Metroplex area. Explore the Exciting Sailing Lifestyle right here in North Texas! We are located at Pier 121 Marina on Lake Lewisville, just minutes from most north DFW Metroplex locations. Our sailing courses range from Basic Keelboat Sailing to Bareboat Certification to Advanced & Offshore sailing. Our Basic Learn-to-Sail courses are taught at Pier 121 Marina. We conduct Bareboat and advanced courses in other exciting locations such as Florida & the Florida Keys, New England, the Pacific Northwest, and Canada. We have a fleet of J-24 sailboats available for rent. 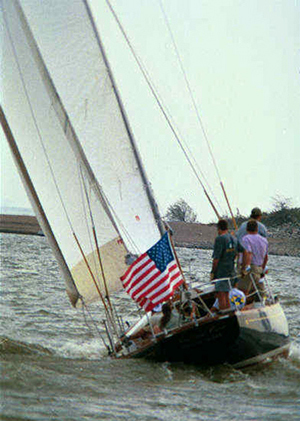 Additionally, we have a 34ft cruising sailboat available to qualified sailors. We offer Captained Charters. Celebrate birthdays, anniversaries, or any other special event by chartering a boat with a sailing captain. Sit back and enjoy! If you are ready to take the next step into the sailors life style we can help. We offer consulting for weekend sailing interest to total live-aboard & cruising commitments. When you are ready to purchase that sailboat we offer both New & Used Sailboats for sale. We strongly believe in developing fundamental sailing skills. To ensure unsurpassed instruction, Nationally recognized Certifications are available from each of our two Sailing Schools. We have a low Student/Instructor ratio. We only put two students on each boat (along with an instructor). This improves the learning curve and doesn’t waste your time by crowding the boat. We are a comprehensive ASA Certification facility. Mastering the sport of sailing requires a knowledge of sailing techniques, safety procedures, and, most importantly, actual sailing experience. We are leaders in promoting safe, competent boating. We are, and always have been, the Metroplex’s premier sailing school. Our curriculum has been developed over many years of experience in teaching and our program continues to set the standard. From time to time, you may notice other sailing schools attempting to emulate our program. Remember, at their best, they will only be as good as we were last year. If you are not willing to settle for second best, seek out the leader! We specialize in individualized sailing instruction and insist on developing fundamental skills at each level of sailing before progressing to the next level. Our lead instructors are nationally acclaimed. Furthermore, they are experienced in the art of teaching sailing lessons. Our specialized lesson format develops proper sailing techniques with carefully designed drills. These drills identify areas needing improvement. Quality lessons are very specialized – much more than just a group lesson for a small group. We invite you to explore our wide range of exciting sailing opportunities. We provide inexpensive ways to investigate our sailing curriculum. For those sincere about sailing, we offer a premier comprehensive curriculum designed to develop competency. Our comprehensive curriculum builds a sound foundation of sailing skills. Complement your learning experience by taking advantage of several sailing programs available. Come check us out! I look forward to personally discussing your sailing goals and helping you get started on your dreams! ASA 101 Basic Keelboat Sailing Certification. 2019 Schedule NOW POSTED ONLINE: Register! ASA 103 2018-19 Basic Coastal Cruising Certification. Register! Jan 2019 (5, 12, & 19), Saturdays: $549/person (+ fees/taxes). Register! Feb 2019, Saturdays (2, 9, & 23): $549/person (+ fees/taxes). Register!